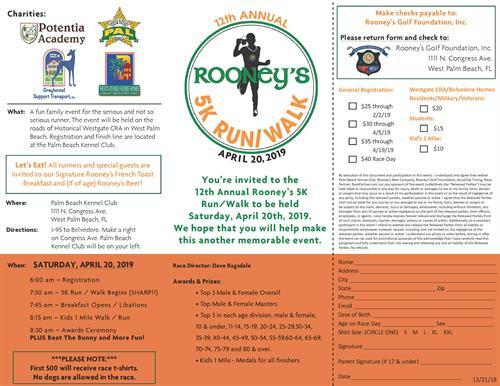 What: The Rooney’s 5K Run / Walk is a family fun event for the serious and not so serious runner. The proceeds from this event will benefit Greyhound Support Transport, Police Athletic League, Potentia Academy, and Westgate / Belvedere Homes CRA. The event will begin at Palm Beach Kennel Club and take you through the historic Westgate/Belvedere Homes area and the Dennis P. Koehler Preserve. After the run, everyone can enjoy fun activities and the “famous” Rooney’s signature Irish breakfast at Palm Beach Kennel Club. -All participants receive a Rooney’s 5K T-shirt, goodie bag, Rooney’s signature breakfast and awards.